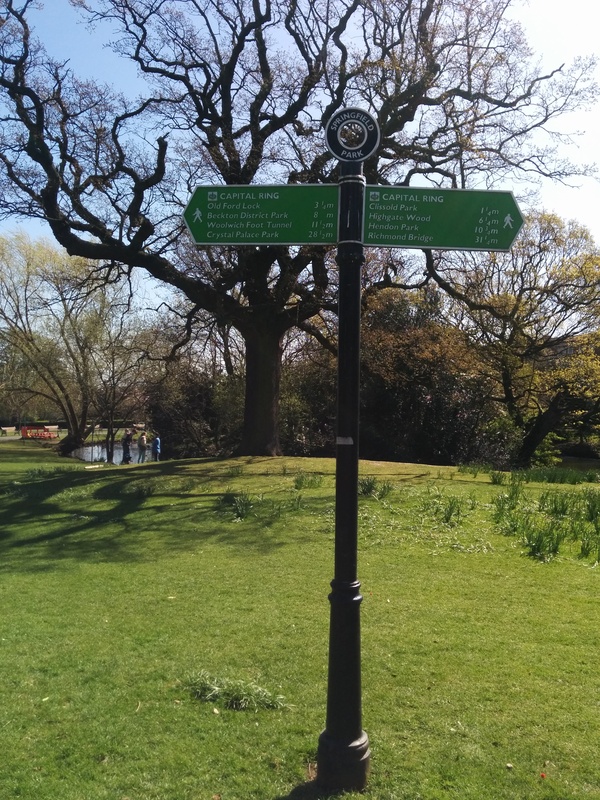 Walking the Capital Ring – From Stoke Newington to Hackney Wick (Section 13) | That's London Baby! This year, I have started on a new adventure – no, not only blogging here, but to discover some new parts of London. Hence, I am aiming to walk all 15 sections of the Capital Ring, one of the major walking trails in London. I don’t want to go into too much background on the ring (planning a more general post on this, as it really deserves some more background and details), but go straight into sharing part of my walk I did last Sunday (and what a sunny day it was!). In terms of numbering the sections, I will just stick with the official names, even if in terms of order, I might do them randomly. Section 13 Runs from Stoke Newington to Hackney Wick and is a leisurely 6km (3.7 miles). You can find all “factual” information and a map with the detailed route from TfL (who manages the walk) – just click here. If you are still reading on (thank you! ), I hope to share some impressions from the walk and a few tips for before / after. Section 13 officially starts in front of Abney Cemetery (a 3 min walk from Stoke Newington Station- exit the station and just walk the main street to the South). Abney Cemetery (established 1840 and will celebrate its 175th Birthday in May with a few events) is one of the “magnificient seven” cemeteries from Victorian Times (the other six are Highgate, Kensal Green, West Norwood, Nunhead, Brompton and Tower Hamlets Cemeteries), and today is a local natural reserve managed by the Abney Cemetery Trust. Technically speaking, Abney Cemetery is still part of section 12 of the walk, so I won’t go into futher detail here, but as a spoiler alert, do take a few minutes to venture behind the large gate to admire a world long gone and see the old ruins of Abney Park Chapel. Also, if you are in a mood to stroll around, or even need a coffee or some food before you even started the walk (or if you doing it the other way around…), Stoke Newington Church Street around the corner has some great shops, cafe’s etc. – its turning a bit into a hipster hangout spot these days. The same goes for the more southern part of the main road Stoke Newington High Street. The Walk goes now down the hill to the tow path of the River Lea and you will not leave that path until the end of the walk- so you must really try hard if you want to get lost :). Once you are down at the River Lea, the Capital Ring now bends South (or as I prefer it for clarity- just turn right!). However, if its one of these Sundays and you have young Children or you are just interested into some technical things, you might want to consider a small detour to visit the Markfield Beam Engine and Museum. Its in Markfield Park about 10-15 min walk (or even a bit less) to the North of Springfield park. 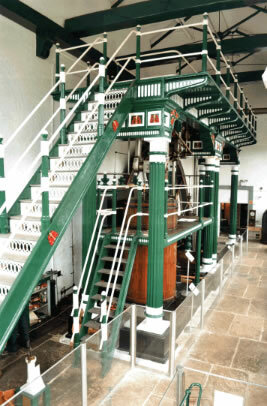 Its a steam Engine built in 1886 for Waterpumping and is a masterpiece of Victorian Engineering. Its still in the original building (grade II listed) engine Building. Its recently been renovated and can be admired when the Small Museum (free!) is open on the 2nd and 4th Sunday of each Month (April to September) from 11am-5pm. There are even days when they run the engine. You can find all the details on the website of the Museum. OK! Back to the main Route!!! No matter if you have done the detour to the Beam engine, the Capital ring follows the River Lea to the south. The River Lea is 68km long and flows from Leagrave in the Chiltern Hills to the Thames. The Capital Ring follows it for a while on its last kilometers. Along the River are a few house boats and some of it house small book shops, cafe’s etc. (probably only open in nice weather but they are a really nice sight!). Very soon after reaching the river path, you’ll have to cross over the old Horseshoe Bridge to get to the other side of the river. You’ll notice that you are walking now 2 walks in one, as the Lea Valley Walk shares the Route with the Capital Ring. On the other side of the river, there are the Walthamstow and Hackney Marshes (I never know which is which!) – big greenlands (supposed to be among the largest areas of Common Land in London!) that have been formed by the flooding of the River during the Centuries. Its perfect pasture land (if you know when to get your sheep to the dry ….) but nowadays its a perfect spot for a picnick- a few tables are provided and otherswise the grass is inviting! As you walk down the river, you’ll pass the Springfield Marina with its many boats and a boats house and a few industrial installations reminding you that this land was used for winning of industrial purposes (e.g. winning gravel) – not sure it this is still operational today. Walk on until you see a quite ugly, round shaped roof hall- Lea Valley Ice Rink. Don’t walk there, but return to the other side via a footbridge. On the Hackney side of things, you’ll pass a few new housing developments and the Princess of Wales Pub which makes a great stop. Soon after, cross the river again (via Curtain Bridge) and stay there until the end of the Walk in Hackney Wick. No sweat here, all is signposted! The next exploring opportunities are the Middlesex Filter beds – a ten acre natural reserve where nature has been claiming its return since the closing of the Filter beds in 1969. You still see the old granite blocks (and there are some that are called “Hackney’s stone henge) but the wildlife is the main draw here – with supposedly more than 60 species of bird amongst others. All very well documented by boards when you walk around. For the final stretch of the walk, you’ll see the silhouettes of the Olympic Park appearing on your left side – the media centre, the Copper Box and last but not least of course the Olympic Stadium. You have the opportunity to leave the towpath and venture into the Olympic Park. On your right hand sight, at the other bank, lies Hackney Wick which can be very exciting or very boring, depending on what time you are there. On the outset, its “only” a very run down industrial area. On the upside, this has attraced lots of artists and experimental venues (plus all the gastro economy catering to them) that take advantage of the cheap space. The whole place is in transformation and on some weekends, its total hipster mainstream featured in Time Out Magazine, on some weekends you feel like you are on the verge of the hipster movement discovering the latest, greatest, yet still secret spaces and sometimes its just plain dead. The walk officially excludes Hackney Wick, but its worth crossing one of the bridges to check out what’s happening. For sure, I can recommend the German Deli if you are after German Stuff and a good sausage. And the street art around the area is some of the best I have seen in London, its really worth a look. I will not go into further detail as Hackney Wick for sure deserves its own blog post – I will link it here if it ever gets written, I promise! Section 13 officially finishes opposite the “white building” – where you can cross the bridge (German Deli will be on your left hand side after the bridge) and walk to Hackney Wick Overground station. The White Building is home of the Crate Brewery and has a lovely sun-flooded terrace directly at the canal (see picture above) – it also not only serves its own beer (and other selected Craft Beers) but has fantastic Pizza as well. More often than not, they’ll have a DJ playing- its a perfect spot to hang around and spend some time and just enjoy life!!! Any other nice spots you can recommend?